Photo: The newly renovated Fashion Focus Academy's state-of-the-art design earned it top honors by Salon Today as well as an industry "Oscar," at the North American Hairstyle Awards. Originally founded by brothers Byron and Richard Weintraub, Fashion Focus Academy is now currently co-owned by Byron's son Aaron and Richard, who is also a partner in Yellow Strawberry Hair Salons. 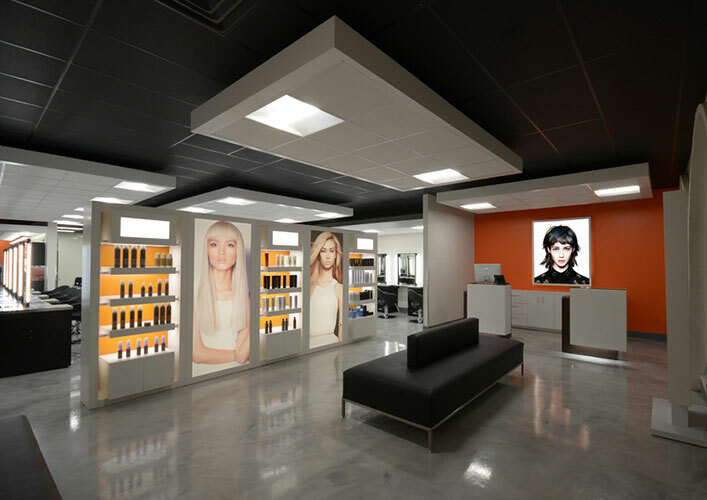 For the 30thAnniversary renovation, the two current Weintraub partners entered a relationship with leading Sarasota-based salon designer Leon Alexander of Eurisko to renovate Fashion Focus Academy earlier this year. Together, their collective vision and resulting salon re-do caught the attention of Salon Today and NAHAjudges. Noted design highlights included the Academy's backlit LED lighting and a barbershop accentuated with dark wood cabinets, which helped Fashion Focus Academy earn a top spot on Salon Today's2018 Salons of Distinctions list. Other design highlights and comments from Salon Today included the Academy's entrance where "guests are welcomed by an amazing set of three 6-foot long visuals of model finishes within the beautiful retail space, as well as two podium check in centers. A vast amount of shelving is accented with backlit LED lighting, and a (new) barbershop is accented in beautiful dark wood cabinets and LED-framed mirrors." "It is true testimonial to have Fashion Focus Academy be selected among the best of the best in the country by two distinctive industry outlets as well as factoring in the more than 86,000 salons and barbershops in the U.S.," said Richard Weintraub. "Most importantly, that as a full spectrum beauty school we are creating exceptional educational experiences for our students who can then carry this forward once they graduate." Space expansion from 4,800 sq. ft. to 5,500 sq. ft. Located at 2184 Gulf Gate Drive in Sarasota, Fla., Fashion Focus Hair Academy was founded in 1988 by partners Richard and Byron Weintraub. Now co-owned by Byron's son Aaron and Richard, they have built one of the leading hair academies in the country, serving as the high-end salon cosmetology training ground for thousands of stylists. The most respected master educators from Pivot Point Difference, utilizing a proprietary Mindful Teaching professional development product, serves as the training module for students, elevating their skills to the highest level of artistic creativity. For more information, visit fashionfocusacad.com.